Regarding real estate risk management I consider that Cheung et al. (2004) makes an interesting note when saying that in today’s society there is a real need for understanding of how property construction risks can be identified and, most importantly, handled in order to address the environmental issues caused by mismanaged real estate risks. Important benefits associated with the development of sustainable designs for buildings refer not only to discounts in rental prices and property market value but also to mitigation of certain real estate-specific risks. A well-structured analysis of how different aspects emerging from the implementation of energy efficiency projects may contribute to the process of property risk reduction is presented by VDP (2008). Maybe one of the most relevant features of green building highlighted in this article is their positive contribution to the environmental conservation and human health protection due to the high standards of materials used in construction, which are not detrimental to either climate or human wellness. This significantly reduces the probability of environmental and/or health damages produced by potentially noxious building materials used in the construction of normal real estate. Therefore, the risks associated with potential litigations or the owner facing liabilities due to the usage of harmful building materials, which may be not in compliance with the regulatory standards, are substantially reduced. Looking at the bigger picture, this will also increase the buyers’ level of confidence in the quality of the building and, consequently, enhance demand and reduce the risk of the property remaining vacant. Moreover, by using eco-friendly materials property developers comply with the increasingly tighter property regulations regarding energy conservation, environment and human health protection. IIGCC’s (2013) report also points out towards the growing climate regulations that impose heavy sustainability pressure on companies. These coupled with climate change risks, are all factors that have contributed to the rapid growth of the energy efficient real estate market over the recent years. In this respect, energy sustainable buildings have proven to be efficient in mitigating various property-specific risks such as the risk of recording high impairment costs associated with the revaluation of properties and the risk of unavoidable, expensive restructuring plans imposed by regulators. Other risks such as the risk of receiving fines due to lack of compliance with current regulations, as is the case of many old buildings, are also substantially reduced. Apart from satisfying regulatory requirements, energy-sustainable buildings have also proved to be highly flexible and resilient to changes in buyers’ preferences in terms of property features. Being able to quickly respond to new requirements imposed by customers, owners of green buildings face lower market risks and find it easier to resale their properties in case of need. 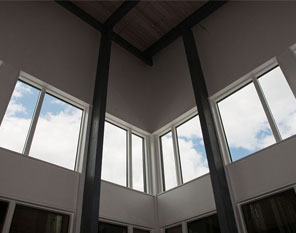 Another benefit derived from the implementation of sustainable buildings is energy optimisation. One of the purposes behind the design of energy efficient projects is the reduction of various costs associated with energy and water consumption. Therefore, risks triggered from unexpected changes in the costs of energy and water supply are effectively avoided. By implementing energy efficiency projects, owners are able to optimise overall consumption of potable water and, potentially, save relevant costs. Energy efficient buildings are also much better designed when compared with normal properties and building plans are very carefully analysed and executed, so as to provide a more sustainable infrastructure. The need for systematic maintenance, which is commonly encountered in the case of normal buildings, is substantially reduced, resulting in a much lower risk of experiencing a downward valuation of the property due to maintenance backlogs. An important element of concern when developing real estate is that property’s potential to create future demand. Sustainable buildings are designed to reduce this type of uncertainty given their high degree of design quality which creates a positive sentiment among potential buyers. Moreover, they are developed so as to preserve environmental surroundings and, at the same time, offer users a high level of functionality. Risks associated with the property having a bad reputation among prospective buyers and potentially remaining unoccupied due to low levels of satisfaction among users are significantly reduced. Ellison and Sayce (2006) indicate that due to the high level of efficiency of sustainable buildings in reducing various risks faced by real estate owners, a diminishing need for risk insurance policies has been reported, which translated into lower costs and, thus, higher cash flows generated from property investments. The authors’ suggestion is supported by Chappell’s and Corps’s (2009) findings, who, after analysing three highly eco-performing buildings, found that the implementation of energy efficient projects leads to a reduction in the level of risk associated with the property and generates significant long-term benefits in terms of reduced costs, increased cash flows. Jiang et al. (2007) and Zhao et al. (2011) have undertaken a more technical analysis of real estate management and project implementation, and identified a series of risks commonly encountered at different stages of the property development process. For example, Zhao et al. (2011) have modelled the various real estate risks by using a fuzzy forecast model, while Jiang et al. (2007) have used an analytical hierarchy process (AHP) based on simulations in order to predict and quantify the major risks involved in the real estate management process. After assessing the potential impact of various risk factors on expected profit to be generated from a real estate investment, on estimated building duration, etc., the authors grouped the identified risks into different risk-levels in accordance with their range of influence. One group of risks, comprising mainly technical and managerial risks, refers to the integrated features of the building such the costs expected to emerge from the construction stage, which in turn relates to the duration of construction, the quality of building materials used, the contracts signed with different suppliers and the specified contractual terms, the technologies required and the quality of management involved. Another group of risks refers to investor-specific risks such as design, payment and legal risks that vary from owner to owner depending on their preferences for property design and investment capacity. The authors highlight that owners face various risks throughout the entire development process, ranging from price negotiation risks, settlement and payment risks, project planning and design risks to legal risks. The last group of risks refers to community and environmental specific risks, which depend highly on the natural environment in which the real estate is developed, on the political believes and moral principles of the community surrounding the construction area, on the community’s willingness to cooperate and also on the level of competition posed by other property developers in that area. By implementing proper models, these risks can be monitored and potentially reduced. Furthermore, their impact on property valuation can be quantified and mitigated in order to optimise the real estate development process. Lee and Jang (2012) studied the real estate risk faced by businesses from a different angle. The authors collected data for a fairly small sample, comprising 57 hospitality firms, over a 5-year time period (2005 to 2009). In order to capture the firms’ exposure to real estate risk they used property betas derived from the two-factor regression model described by Jorion’s (1990) and found that the firms’ share returns were positively correlated with the property returns, which indicates that the firms included in the sample were exposed to real estate risk. They considered the hypothesis that firms are perceived as being much riskier when they own their properties or get involved in financing leases to acquire the use of real estate because they actually register those properties on their balance sheets and, consequently, bear all the risks and benefits associated with holding those assets. On the contrary, their counterparties, which acquire the use of real estate through operating leases, do not face the same high level of risk. The authors identified the real estate risk as systematic (non-diversifiable) risk due to the fact that a business’ exposure to this type of risk depends on macroeconomic factors and, thus, is highly correlated with the market risk. Furthermore, given the nature of the real estate risk (i.e. return generating type of risk), businesses that account real estate as a significant proportion of their total long-term assets, tend to be valued lower than their counterparties which get involved in franchising or operating leasing because their assets would appear to generate lower levels of cash flows. Moreover, firms owning real estate are perceived by investors as being riskier than other firms and, therefore, they are expected to generate higher returns on investments. The authors concluded that businesses face significant risks because of their real estate ownership and, given that this risk is viewed as return-generating, investors tend to add pressure on those firms’ management to provide them with higher returns. Businesses can, however, protect themselves against real estate risk by hedging with derivatives such as real estate investment trust securities (REIT), whose underlying asset displays negative correlation with the property industry market. Although the results of Lee’s and Jang’s (2011) study have clearly highlighted the presence of real estate risk in the hospitality industry, it suffers of limitations especially due to the small size of the considered sample and the short time period of observation. Nasirzadeh et al. (2013) contribute to the risk management process in property development by demonstrating that both the duration of the construction project and the costs required to complete that project depend on the management’s ability to effectively allocate risks between the owner of the property and the appointed constructor. Their findings indicate that the optimum proportion of risk allocation, so as to minimise the property construction costs, is 55% to the contractor and 45% to the owner. In order to determine this optimum level the authors conduct a fairly comprehensive analysis, involving both qualitative and quantitative risk assessments. For the qualitative analysis they identify all factors with a potential impact on the risk allocation process, including both owner- and contractor-specific factors, using a “FLM” risk model and based on the recommendations of the field experts and also on the theoretical believes discussed in the academic literature. The reliability of the results comes, however, from the quantitative analysis built upon the qualitative one. For this, the authors use an “integrated fuzzy system dynamics (SD)” approach. One of the most interesting aspects which, in my opinion, Nasirzadeh’s et al. (2013) findings reveal is that when the risks involved in the construction process are entirely borne by the owner the project, cost is lower than that measured when all risks are transferred to the contractor. The reason put forward by the authors is that the contractor demands to be compensated for the risk taken by implementing various defensive strategies, which ultimately translate into higher total costs getting allocated to the construction project. Similar results are observed with respect to the project duration, with the minimum number of construction days when risks are shouldered 100% by the owner and the maximum when they are totally transferred to the constructor. Therefore, Nasirzadeh’s et al. (2013) findings show that the defensive strategies adopted by the contractor, in order to guard against eventual losses triggered by the enhanced risks taken, represent one of the most important factors determining a successful risk allocation. Wang and Yuan (2011), who acknowledge the real importance of the decision making process based on risk evaluation, contribute further to Nasirzadeh’s et al. (2013) analysis by identifying other factors with a high potential impact on the construction contractors’ risk behavior in property development in China. After conducting a comprehensive analysis, including: (1) an in-depth revision of the relevant academic literature regarding the real estate risk management, which answers the questions about what types of risk are most likely to occur within the construction and planning of properties and also to what extent these risks may affect the property development process –, (2) interviews with major Chinese contractors with regards to their attitude towards construction risks and which factors may affect their attitude – , and (3) a two-section questionnaire, which refers to the quantitative element of the analysis and sums up relevant information about the respondents chosen among Chinese contractors and the critical factors that may affect their risk attitude – the authors have selected the most relevant factors that may have to greatest impact on risk attitude adopted by contractors over the planning and construction processes. From a total of 26 factors initially selected the authors have found 16 factors to be statistically significant from which 12 were highly related to the personal experiences and characteristics of constructors. However, the authors have selected only three factors with the most significant impact on constructors’ risk attitude according to their statistical explanatory power, as follow: (1) the aftermath effects of decision making, (2) the engineering know how, and (3) the full accessibility to any information regarding the construction project. Furthermore, by applying the factor analysis statistical method they have identified four representative classes able to characterise the previous 16 selected factors, such as: the first class comprises all factors describing the expertise and know – how the contractor has with regards to the project under development; the second class refers to those factors characterising the personality and traits of the contractor such as motivations, interests, moral values, etc. ; the third class includes those factors which explain the contractor’s personal objectives and desires with regards the completion of the construction project; the forth class comprises those factors related to the external economic conditions. Wang’s and Yuan’s (2011) final results indicate that, statistically speaking, the first category of factors (of those mentioned above) plays the most critical role in affecting (but not necessary influencing) the risk attitude adopted by contractors in the planning and construction phases of property development, given the fact that it accounted for 41.43% of the overall variance of the 16 analysed factors. It was followed by the other remaining classes, in ascending order, which represented 20.62%, 13.42% and 7.59%, respectively. As suggested by the authors, this information may prove to be very useful to property owners who are looking for signing with a contractor, because, by being aware of the representative factors that are most likely to affect the contractor’s perception and attitude towards risk, the owner is able to make better contracting decisions tailored to satisfy his construction needs so as to achieve costs minimisation and value maximisation. While fairly comprehensive, the analysis undertaken in Wang’s and Yuan’s (2011) has its limitations. One of the most serious limitations is that the factors identified as relevant for this analysis are, indeed, likely to affect the contractors’ behavior towards construction risks, but this does not necessary means that they can also influence that behavior. There is no doubt that all these findings regarding construction risks provide useful insight into the process involving real estate risk management. However, the ultimate purpose of this article is to assess the ways in which these risks can be related to the risks implied in the development of sustainable buildings. Bearing this in mind, I consider that Eom and Paek (2009) make a relevant contribution by designing an environmental risk index model in order to capture the risks involved in developing sustainable properties. The purpose of developing this model is to solve as many as possible of the problems imposed by construction projects on the natural environment. According to Chen et al. (2005) an important reason behind the work of implementing sustainable real estate projects is the pressing need for addressing environmental issues derived from inefficient construction programs. Throughout the project I have extensively discussed the role of sustainable real estate project implementation in the reduction of property purchasing costs and rentals. In this respect, Eom and Paek (2009) make a fine connection between property risk management and property costs by arguing that the implementation of environmentally sustainable projects contributes to the mitigation of conflicts arisen due to environmental problems caused by poor construction programs and, consequently, to reductions in property construction costs. Running the model, Eom and Paek (2009) identify ten factors with a high potential to have an important role to play in the equation between environmental preservation and construction requirements. By going further with the analysis, the authors select two factors which are most likely to lead to decreases in environmental issues and to reductions of property construction costs implicitly, such as: (1) a proper and careful planning system regarding both construction and environmental projects, and (2) an efficient involvement of the local tenants in the process of decision making. In terms of risk management systems implementation Khoo et al. (2005) describe a fairly comprehensive system, called “Intelligent Risk Mapping and Assessment System” (or IRMAS), which involves several stages until reaching a conclusion regarding the risk of a project. The initial stage implies gathering information about the project in order to gain a strong understanding of its organisational and structural characteristics. This stage is very important as it helps management understand the project and allows it to continue with the second stage, which involves identifying all potential risks that may appear throughout the entire life cycle of the project. The merit of IRMAS at this stage is that it permits the classification of the identified risks into different risk-classes. By using further a workbench the system is able to identify the risks with the highest possible impact on the project development, which provides managers with an opportunity to mitigate those risks.